(Reuters) – Nepal’s Maoist former rebels, trailing in last week’s election, have called for an independent investigation into complaints of vote fraud, but they also signalled willingness to compromise to end political deadlock in the Himalayan nation. The Maoists, who fought a decade-long civil war before joining the political mainstream in 2006, alleged last week that the elections were rigged, saying ballot boxes had been hidden, stuffed or swapped. Powerful Maoist leader and former rebel chief Pushpa Kamal Dahal – better known by his nom de guerre Prachanda – had also threatened to boycott the new constituent assembly tasked with drafting a new constitution. That elusive landmark was a major condition in a peace deal that ended a conflict that claimed more than 16,000 lives. “Our party wants a high level independent commission to investigate into the widespread conspiracy and fraud,” Maoist spokesman Agni Sapkota said in a statement. “The new constitution should be prepared on the basis of a consensus among political parties … and even those parties that boycotted the elections should be involved in the making of the charter,” Sapkota said. The marked softening in language, and reference to consensus, pointed to readiness to accept the outcome of the November 19 election, political analysts said. Some Maoist leaders had already said they did not agree with Prachanda’s position and wanted to join parliament. “There is a good chance they will participate in the constituent assembly, even if it is mainly to safeguard their pet agendas, including federalism,” said Deependra Bahadur Kshetry, a former central bank governor and now an analyst. Kshetry was referring to Maoist demands for federal states in a country with more than 100 ethnic and linguistic groups. Prachanda’s rejection of the poll outcome triggered intense lobbying from former U.S. President Jimmy Carter, who was in Nepal to observe the election, as well as by ambassadors from donor countries including the United States and India. Nepal has languished in political inertia since Maoists laid down arms, with six governments failing to forge a constitution for the new republic that emerged after the war. Nepal’s giant neighbours, India and China, as well as Western donors, are concerned about the prolonged struggle to build a stable nation to replace a centuries-old monarchy. They fear the poor country of nearly 27 million people, which is dependent on tourism, remittances and aid, risks becoming a haven for militants and criminal gangs. International observers, including from the European Union, have said the election was held in an “orderly and generally calm atmosphere”. The Maoists, the biggest group in the 601-member assembly in 2008, trailed the centrist Nepali Congress and moderate Communist UML parties in the latest counting, the Election Commission said. Counting could continue into next week. 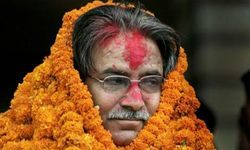 Prachanda won a seat from southeast Nepal but lost in his old constituency in Kathmandu. He has faced accusations that he strayed from revolutionary ideals since joining the mainstream, moving from a life in the jungle during the insurgency to a luxury home in Kathmandu. More than 70 percent of 12 million eligible voters cast ballots, a high turnout that underlined the desire for progress after previous failures to draw up a constitution. The stalemate has damaged the business climate, slowed economic growth to 3.6 percent and forced an average of 1,600 young and unskilled Nepalis to leave each day for the Middle East, South Korea and Malaysia in search of menial work. Kathmandu — Millions of Nepalis defied low expectations and threats of violence to vote Tuesday in elections seen as crucial in stabilising the country and breaking its political deadlock seven years after a civil war ended. A bombing in the capital Kathmandu early Tuesday injured three children, but the explosion and a campaign of intimidation by a hardline Maoist splinter group did not prevent a high turnout, according to election officials. Chief Election Commissioner Neel Kantha Uprety told a press conference late Tuesday that preliminary figures showed a 70 percent turnout. At this level it would be higher than the 63.29 percent turnout recorded during the country’s first post-war elections in 2008, when it voted for a constituent assembly tasked with writing a new constitution. “Voters have given their decision and it clearly points towards a constitution. I hope this is the last election for a constituent assembly in Nepal,” Uprety said. Since 2008, five prime ministers have served brief terms, the country had no leader for long periods, and the 601-member assembly collapsed in May 2012 after failing to complete the peace process. “My vote is for the future of youngsters and the new generations,” 101-year-old voter Lal Bahadur Rai told AFP in a phone interview from a polling station in northeastern Sankhuwasabha district. Many analysts had judged the national mood to be downbeat as threats of violence and intimidation added to years of political infighting and drift. Hopes of political unity to complete the peace process were dashed when a 33-party alliance, led by the splinter Communist Party of Nepal-Maoist (CPN-M), announced it would boycott polls and intimidate voters. In recent days, protestors have torched vehicles and hurled explosives at traffic, leading to more than 360 arrests and one death. In Kathmandu, a crude bomb explosion in a middle-class residential neighbourhood was the only major violent incident amid a security crackdown which saw 50,000 soldiers and 140,000 police deployed. “I was passing by when I saw three children lying on the ground, crying for help,” 28-year-old eyewitness Saroj Maharjan told AFP at the scene. “One of the children, whose face was covered in blood, fainted in my arms as I carried him to a nearby hospital,” he added. Home ministry spokesman Shankar Koirala told reporters late Tuesday: “25 people were injured in election-related clashes across the country”. The Maoist party, led by Pushpa Kamal Dahal, known better by the nom-de-guerre Prachanda, swept the first constituent assembly polls in 2008, two years after signing a peace deal. Prachanda, the former rebel leader whose lavish lifestyle has alienated many core supporters, voted in the southern district of Chitwan in the morning wearing a shirt and Western-style black suit. Organising the election has been a logistical headache in a country home to eight of the world’s 14 highest mountains, requiring helicopters, horses and porters to deliver ballot boxes to remote areas. “Some of the voters have trekked for five hours to reach here. They include elderly as well as young first-time voters,” Gitachari Acharya, an official at the nearest polling station to Mount Everest, told AFP. Nepal’s political deadlock in the last five years has had a severe impact on the economy, with annual GDP growth tumbling from 6.1 percent in 2008 to 4.6 percent last year, World Bank figures show. With 39 percent of the country aged between 16 and 40, according to government data, jobs are a major issue for young first-time voters like Urmila Maharjan. The 22-year-old Kathmandu-based student told AFP she hoped “the new assembly will address issues like unemployment”. Voters at one central Kathmandu polling station applauded and chanted “victory to Nepal” as election officials packed up ballot boxes. More than 100 parties, including three major ones — the Unified Marxist-Leninist, the Nepali Congress and the Maoists — are fielding candidates for the constituent assembly, which will also serve as a parliament. The anti-poll alliance had said the vote could not be held under the interim administration headed by the Supreme Court chief justice and wanted elections to be postponed until a cross-party government was put in place. “Had the anti-poll groups organised peaceful protests, they could have questioned the legitimacy of the elections,” Akhilesh Upadhyay, editor in chief of The Kathmandu Post, told AFP. Election officials said the counting of votes would begin at midnight and preliminary results would emerge within three days. Full results will be announced in about ten days, the chief election commissioner said. New Meme from Nepalese Maoists? “We need capitalism before socialism” says Prachanda, the head of the Communist Party of Nepal (Maoist), according to a report in the The Independent . This is one of those old Marxist ideas that must take off again if a genuine left is to re-emerge from the ether. It has to become a new meme. What Prachanda is referring to is the fact that a system based on social ownership can only be built on the conditions created by capitalism. This means eliminating the conditions that are the basis of class society – routine labor, low levels of education, a general lack of sophistication and economic backwardness. Look at it this way. A society based on sharing is only viable when we are generally sharing good things, in particular interesting jobs and affluence. Sharing poverty and jobs that should be done by machines is a no show. Furthermore, we need average people who can do most of the thinking and deciding, and when they cannot, are at least able to monitor and hold accountable those with special knowledge and ability.